THE CAVE TEMPLES AT BADAMI THE CAVE TEMPLES AT BADAMI - Shiva Maha Purana, Vishnu Purana, garuda purana, bhavishya purana, skanda purana. Situated picturesquely at the foot of two hills and a beautiful expansive tank, Badami is a small town in Bijapur district of Karnataka, which is now an important tourist centre. Badami, under the name of Vatapi was the capital of the Chalukyas in the sixth century. It is famous lor its cave temples, which were constructed during the golden period of the Chalukyan rule. One of the greatest sculptors India has produced, known as Gunda, is supposed to have worked out fine idols in the four cave temples of Badami. Excavated from huge blocks of rock of the mountain between the sixth and eighth centuries, there are four caves located at varying heights, and connected by a flight of steps up to the cliff face. 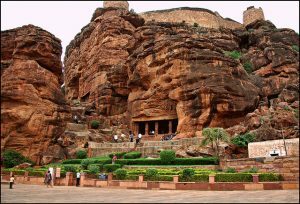 In the first half of the 6th century, the town of Badami was fortified by King Pulikesi I; the four cave temples were hewn during the period of his sons. The 111 st cave is dedicated to Shiva, the second and third to Vishnu and the last is a Jaina cave. The Shaiva cave, very close to the village and facing the north, is cut on the face of the southern hill near the tank. A I light of 35 steps leads to the entrance of this cave. In the verandah on the proper left side of the cave is carved a beautiful sculpture of Nataraja (Shiva in dancing form), with eighteen hands. Among other things, he holds a snake, a damaru’ a musical instrument and a ‘trisula’. His other hands are in different dance poses. His head is covered with i tigged matted hair and he is dancing on a lotus pedestal in the ‘dwibhangi’ pose. The Nataraja sculpture is a masterly example of the early Chalukyan art. I n the compartment to the right of Nataraja is carved a sculpture of Mahishasuramardhini. She is seen holding up the demon Mahisha by the tail and is piercing him with the “trishula’. She wears the sari in the‘vikatachala’fashion and stands in‘tribhangi’ posture. A good number of bangles dm orate her hands. A beautiful figure of Ganapathi is carved on the proper left wall of Mahishasuramardhini. He has only two hands and holds in his right hand his broken tusk and in the left hand he carries a pot of sweets. On the wall right opposite to Ganapathi, is Shanmukha riding upon a peacock. He holds the reins in his hands. The pose of his sitting merits our attention. Below the figure of Shanmukha, is seen a fine piece of artistic skill where only two boys are arranged to give the impression of four. Similarly there is one of an elephant and a bull with one body. The sculptors have indulged in some fanciful imagery in this cave. Other figures are those of Ardanarishwara and Harihara. Like all other caves, the interior pillars are luxuriously carved in stark contrast to the almost Spartan exterior. There is a fine Naga sculpture with five heads and a tail curved in concentric circles on the ceiling. The shrine which has a carved Shiva Linga is located in the central part of the hind wall of the cave. A flight of steps leads to the second cave temple also lacing north. On the front platform of the cave are carved I lie figures of dwarfs in an amusing style. On either side of i lie cave, on the outside, stands a ‘Dwarapala’ image. A huge figure of Varaha Murthy is carved on the eastern wall of the verandah. To the left is represented a male Naga with seven hoods. His consort too is seen as by his side. In the window above Varaha is seen as Vishnu riding on Garuda. Just opposite the image of Varaha on the western wall stands the sculpture of Trivikrama, another incarnation of Vishnu. To the left of Trivikrama, Vamana in the form of a dwarf is seen holding an umbrella, receiving the gift from king Bali. Above the cave is a natural cavern wherein is a carved figure of Buddha as ‘Padmapani’, holding a lotus flower in his right hand. towards the east and passing through a door frame, this cave can be reached. Old inscriptions are noticed on either side of the door frame. This cave is by far the finest of series and in some respects one of the most interesting Brahminical works of India. Like the other caves this also faces north. According to an inscription, it is believed that Mangalesha, younger brother of Chalukya Keerthivarma I got this cave excavated in the 12th year of his reign, and enshrined therein an image of Vishnu. Unfortunately, the sculpture is missing now. The plinth has a group of ‘ganas’ or mischievous spirits indulging in playing on the musical instruments. Lovely massive brackets of amorous human couples are sculptured on the plinth. The sculptors of Badami have bestowed greater care in the preparation of these figures. Outside this verandah and above the platform on the proper left wall stands a huge figure of Trivikrama cut in bold relief. This sculpture, like the one in the second cave of the same deity, displays the magnificent form of Vishnu. To the opposite of this Trivikrama on the eastern wall stands a huge image of Vishnu with eight hands. Over the image of Vishnu, a little higher up, is carved an image of Narasimha. A Gandharva couple can be noticed inside the cave to the right of Vishnu. There are six pillars on the front of the Verandah. On these pillars are exquisite carvings of god and human beings m superb sculpture. On the west wall is carved a huge figure of Narasimha with four hands. On the right wall of Narasimha stands the image of Harihara, the right half of tin image representing Shiva and left half of Vishnu. The right side of the path leads to the fourth cave, also facing north, which has some inscriptions in Kannada script on its front wall. This is a Digambara Jain cave situated at a greater height than that of any other cave scooped out in the southern hill. As a Jaina ‘Basadi’ was situated at the top of this cave, this was known as ‘Megana Basadi’, meaning ‘the temple situated at the top’. From the archaeological evidence it appears that the cave was excavated in the 7th and 8th centuries. This cave is dedicated to Adinatha Tirthankara. On the western proper left wall of the cave to the front, is a sculptured panel of a Tirthankara seated on a pedestal. On the proper left wall of the cave the image of Suparswanatha is cut in bold relief. Opposite is a handsome image of Bahubali. On the right side of the ‘mandapa’ stands an image of Mahavira Tirthankara. A nice view of the big pond below, the Bhutanatha group of temples, Malegitti Shivalaya, the town below and the temples on the northern hill, etc., can be seen from this place. Badami town seen in the golden twilight of the evening presents an enchanting view. Coming down the hill from the caves, the first monument that arrests the attention of the visitor is a huge mosque built by Tippu Sultan during the 18th century. On the left of the lane leading into the town there stands the temple of Dattathreya which has a fine image of the deity. Near this temple is the shrine of Ellamma built in the later Chalukyan style of about the 12th century. Further in the same lane, is the Mallikarjuna temple, built in the later Chalukyan style. The Bhutanatha temple has a ‘vimana’ of the Nagara type; but it comes closer to the southern type of Tamilnadu. This might have been constructed some time during 650 A.D., after the Pallava occupation of Badami. The relationship between the Chalukyas of Badami and the Pallavas of the south had some effect in the development of architecture. The temple of Nagara style at Badami made the Pallavas to adopt the Dravida style in their capitals. It may be interesting to note that the great Muthusami Dikshitar has composed a song in praise of Ganesha of Vatapi. Tradition has it that the sculpture of Ganapathi which is now at Tiruchirapalli was carried away from Badami by Pallava Narasimhan. it is quite likely that originally this image was at the Lower Shivalaya at Badami. Badami can be reached by road or by rail. Bijapur would be the convenient base to travel on the road. Regular buses operate to Badami at frequent intervals. A convenient guest house is available at Badami for the tourists.